District 20 House candidate Darian Unger has fired his campaign manager for stealing and destroying literature belonging to his opponents. Unger terminated him immediately upon seeing video of the act. Unger’s campaign began paying John Rodriguez as a campaign manager in November 2017. Rodriguez was profiled by the Washington City Paper’s Loose Lips in 2016 for his work with a firm called District Political in D.C. political campaigns, including fundraising. The article ends with these paragraphs. Apparently, Rodriguez still has some money to splash out. While LL was reporting this column, Rodriguez called, unbeknownst to his partners, to ask the name of the City Paper employee in charge of ad sales. He went on to ask whether LL would be aware if City Paper suddenly received a lot of money, and pondered how much he would have to spend in ads to gain more “power” to kill stories like this one. It’s one more offbeat scheme from an outfit that tried to make its name with unlikely candidates. Unluckily for District Political, though, the problem with underdogs is that they tend to lose. Update, 10 a.m.: According to a District Political statement released shortly after this article was published, Rodriguez is no longer a partner at the firm. Now to the matter at hand. The video below is security footage from the Silver Spring Civic Center on June 17. At the beginning of the video, Senator Will Smith, Delegate David Moon and House candidate Lorig Charkoudian can be seen delivering lit to a storage area. 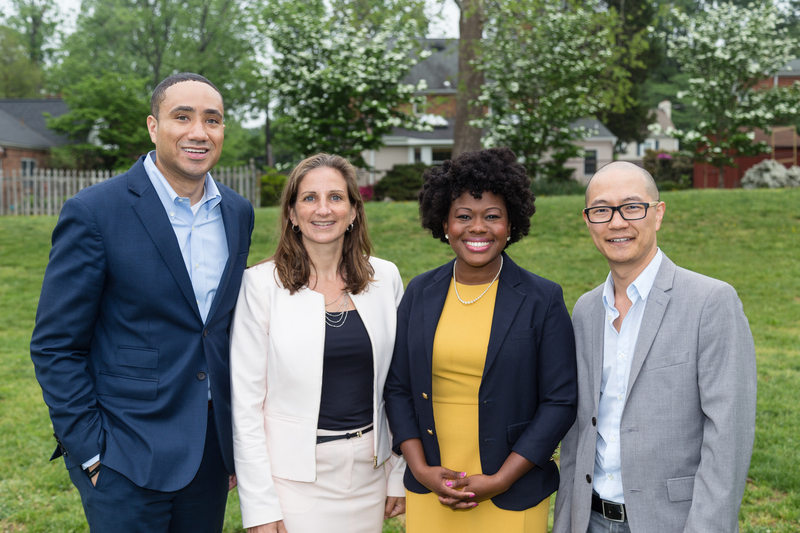 Smith, Moon and Charkoudian are running as a team in District 20 along with Delegate Jheanelle Wilkins. Unger is a House candidate in the same race. Smith deposits a box of lit on top of other materials and the group departs. Soon after, a man matching Rodriguez’s description enters the room, looks around, grabs the lit box and places it in a dumpster outside. As of this writing, we are unaware of an apology by Unger to the District 20 team. The decision to include a non-incumbent on the slate is reminiscent of 2014, when Senator Jamie Raskin and Delegate Sheila Hixson teamed up with new House candidates Moon and Smith. In that election, all four were on the Apple Ballot. That’s not true this time around as MCEA has supported Smith, Moon, Wilkins and second-time House candidate Darian Unger. In addition to the incumbents, Charkoudian is supported by Casa in Action, the Laborers Union, MCGEO and NOW. Unger is supported by MCEA, SEIU Locals 500 and 32BJ and the Volunteer Fire Fighters. (Unger is himself a volunteer.) On May 22, Charkoudian reported a cash balance of $37,226 and Unger had $27,897. Everybody in this district is broke, including the incumbents. Gone are the days when Jamie Raskin, Sheila Hixson, Heather Mizeur and Tom Hucker were raising money hand over fist and Jonathan Shurberg was writing himself six-digit checks! If money is not a differentiator, the landscape will favor the three incumbents: Senator Will Smith and Delegates David Moon and Jheanelle Wilkins. We anticipate that the three will team up, combine resources, get most if not all of the institutional endorsements and be reelected. That leaves a contest for the open seat being vacated by the Queen of District 20, long-time Delegate Sheila Hixson. Lorig Charkoudian, who runs a community mediation non-profit, has deep roots in Takoma Park and has been an advocate on progressive legislation at the state level (including abolishing the death penalty). She finished second for last year’s Delegate appointment to Wilkins. Howard University professor and volunteer fire fighter Darian Unger ran for the House in 2014 and finished fifth. In that race, Unger was endorsed by the Washington Post, the Gazette, the Volunteer Fire Fighters, the Sierra Club and the League of Conservation Voters. The Big Question: will there be a mixed slate featuring the incumbents and either Charkoudian or Unger? Such an event would be a repeat of 2014, when incumbents Raskin and Hixson teamed up with newcomers Moon and Smith to sweep the primary. We should run a poll of Seventh State readers on whether this district is messier than District 17. Last time, the four incumbents – Senator Nancy King and Delegates Charles Barkley, Kirill Reznik and Shane Robinson – had no primary opponents and cruised to reelection. This year, Barkley’s decision to run for County Council At-Large has opened a seat. MCGEO President Gino Renne threatened to defeat Reznik last May a month after Renne’s employee, Gabe Acevero, began his campaign for the House. Shortly thereafter, the incumbents chose to slate with newcomer Lesley Lopez and it was Game On. Just last week, County Executive Ike Leggett piled on, endorsing Acevero and accusing the incumbents of slating with Lopez in a “smoke-filled room.” That’s an ironic comment from Leggett considering that he was first elected in 1986 as a new candidate invited by incumbents onto a mixed slate. Putting aside the admittedly fun political food fight, the data above shows one salient fact: no one has any money except the incumbents. That’s a big deal for Lopez as she can benefit from pooled resources with the rest of her slate. Acevero’s path to victory necessitates rolling up lots of labor support – and not just from MCGEO and its affiliates – and raising enough money to break through. That’s not easy to do in this district, which lacks the legions of liberal activists of District 20 and the wealthy neighborhoods of Districts 15, 16 and 18. The Big Question: will the tumult over the incumbents’ mixed slate filter down to the voters or is it just something that the chattering class (and obsessive bloggers) will yap about? If it’s the latter, the slate strategy could pay off. She won the MCDCC appointment after three ballots. Lorig Chardoukian made it an exciting contest! Congratulations, Jheanelle! MCDCC has announced the application process but not the deadline for applications or the date of the meeting to fill the delegate vacancy in District 20 caused by their appointment of Del. Will Smith to the Senate. That vacancy, in turn, resulted from Sen. Jamie Raskin’s resignation to take up his seat in the U.S. House. While delegates invariably form obvious candidates to fill Senate vacancies, delegate vacancies are more wide open. Central Committee Member Jheanelle Wilkins plans to apply. However, I imagine there will be many other people vying for the appointment. It’s a pity that the appointment won’t take place until January, as that is when the annual session of the General Assembly begins. Let’s also hope Gov. Hogan doesn’t sit on the appointments too long once they’re made. On December 7, 2016, the MCDCC nominated District 20 Delegate Will Smith to serve the remaining term of the District 20 Senate seat vacated by Jamie Raskin’s election to the U.S. House of Representatives from Congressional District 8. The formal nomination was submitted to the Governor on December 8; he will have 15 days to act on the nomination, which ensures that a vacancy will occur in the District 20 Delegate position. The MCDCC is announcing the intention to hold a public meeting in the second week of January, 2017, to nominate an individual to serve the remaining term of Delegate Smith’s District 20 position. The date and location of the MCDCC Special Meeting will be announced in the next few days. The applicant for the District 20 Delegate nomination may be a male or female, must be 21-years or older on the day of the nomination meeting, be a registered Democrat, and must have resided in Maryland for at least one year and in Legislative District 20 for six months prior to the nomination meeting. The MCDCC reserves the right to confirm any information provided in an applicant’s cover letter and/or resume. Applications must submit a 1-page cover letter stating the position applied for, as well confirming that they have resided in Maryland for at least one year and in District 20 for at least six months. In addition to the cover letter, please include a resume of no more than two pages that includes current employment, current and/or past positions in the MCDCC precinct organization or other elected positions, employment information, a history of involvement in past political campaigns, volunteer history for the Democratic Party, and current or past membership in MCDCC-chartered Clubs and Caucuses or other clubs related to Democratic politics. The MCDCC will or may post all applicants cover letters, and/or resumes and/or endorsement on the MCDCC website (www.mcdcc.org) to allow for public review. The application deadline will be announced when the notice of the date and location for the MCDCC Special Meeting is distributed. MCDCC Rules require that the deadline for submitting applications for legislative vacancies is 5:00 pm before the day of the nomination meeting. However, we encourage you to submit your application as early as possible to give MCDCC members and residents of District 20 adequate time to review your application. You may mail the application to the MCDCC office at 3720 Farragut Ave. #303, Kensington, MD 20895 (it must be received by the deadline), email the application to montgomerydems@msn.com, or drop off the application at the MCDCC office at the address above. A confirmation email will be sent to you when the MCDCC receives your application. That email may have further information about the process for filling the vacant position. The public is invited to attend the January meeting. Below is a list of suggestions for applicants to increase their visibility before the vote to fill the vacancy. · Contact MCDCC members at any time during the application period (see contact information for MCDCC members at www.mcdcc.org/about/#centralcommittee. · Gather endorsements from residents of District 20, elected officials, community organizations, or MCDCC-chartered Clubs and Caucuses (see www.mcdcc.org/get-involved-2/clubs/ for a list of MCDCC-chartered Clubs and Caucuses). · Attend the MCDCC meetings on Tuesday, December 13 and Tuesday January 10, 7:30 pm, at the MCDCC office to meet MCDCC members in an informal setting. · Participate in community events and forums being planned to acquaint District 20 residents with the candidates as they address resident questions and concerns regarding the vacancy. For questions, please call the MCDCC office during business hours (10:30 am-3:30 pm) at 301-946-1000, or by email at montgomerydems@msn.com.